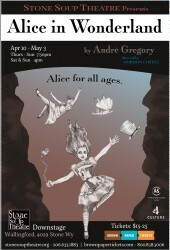 An adaptation of Alice in Wonderland opened Friday, April 10th at Stone Soup Theater. The stage full of psychedelic costumes, Alice only identifiable by her blue bow, as the character playing Alice changes throughout the play. Starting off with Lewis Carroll, Reverend Duckworth, and three little girls in a row boat on the River Thames, telling a story, before it became a manuscript. Lewis Carroll, a pen name for Charles Lutwidge Dodgson began telling the story at the request of Alice Liddell, one of the little girls in the row boat, the namesake for the book he would later write. In a whimsical, family friendly, one act play, that runs just a little over an hour long seven of the twelve chapters make an appearance in Gordon Coffey’s interpretation of Alice in Wonderland. The most memorable moments from the book, Alice falling down the rabbit hole, growing large and small, the confusing caucus race, appearances from the memorable Caterpillar and Cheshire cat, a Mad Tea Party, Queens croquet, and Humpty Dumpty- All of the parts of Alice in Wonderland that you would retell to your children. The meanings underlying in Carroll’s original story coming out under the direction of Coffey. A humorous rendition of the characters in Carroll’s book, the actors bring the characters to life with minimal props, no costume changes, over the top, effective gestures and vocal changes. An inquisitive little girl, longing for adventure, then desperate to go home the audience is taken through the range of emotions along with Alice on her journey through the rabbit hole. With 7 actors on stage at any given time the eye was always on the move. The actors moving between characters, adds to the controlled chaos on stage. If the audience isn’t familiar with the story the play could be confusing and disorientating. Alice in Wonderland, by Lewis Carroll, adapted by Gordon Coffey. Runs through May 3rd. Friday and Saturdays 7:30pm, Saturday and Sunday matinee’s 3pm at Stone Soup Theater in Freemont, 4029 Stone Way N. Seattle WA. Tickets: http://www.brownpapertickets.com/event/1374833 Info: www.stonesouptheatre.org 206-633-1883.